More than fifteen thousand Arrowmen – Scouting’s best – converge on the campus of Michigan State University in East Lansing starting today to take part in the largest Scouting event in the United States other than the National Jamboree. The National Order of the Arrow Conference, or NOAC, gives these young men the opportunity to participate in a wide range of leadership enhancing, life-skill development and fun activities while living on a college campus for a week. Scouts travel and live with those from their home lodge but will meet and participate with others from around the country in a wide variety of activities intended to not only help them be better lodge and chapter officers and leaders but to be of service to their troops and others in Scouting. Training sessions include subjects like high adventure, camping, ceremonies, American Indian activities and supporting their local units. Historical exhibits give attendees a glimpse of Scouting’s origins and the opportunity to see items such as memorabilia from the first hundred years of the OA. There’s plenty of fun, too, with sports and competitions that challenge Scouts physically and mentally, and nightly arena shows that feature keynote speeches and entertainment in a once-in-a-lifetime setting. 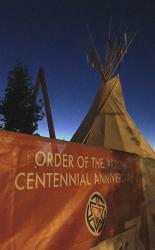 Special activities to celebrate the centennial include legacy displays by each lodge, giving a comprehensive look at the OA as it grew and developed across the country. A centennial fire will serve as the centerpiece of the rededication effort that’s been ongoing since the last NOAC. Each lodge participates by contributing wood for the fire. There’s a centennial gala which looks ahead to the next hundred years and challenges invited guests to start thinking of ways to make it happen. A popular feature of the conference is the NOAC Experience Tent. Here, more than three dozen organizations, vendors and activities will be available for Scouts and staff to check out. 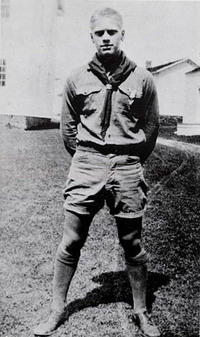 Scouting organizations such as the National Eagle Scout Association, high adventure bases and local council programs are joined by groups such as the American Indian Scouting Association and the International Fellowship of Scouting Rotarians. Part of the Experience is the BSA’s official amateur radio station, K2BSA. Scouts will have a chance to speak via shortwave radio to hams across the country and around the world. I’ll be part of the K2BSA operation, which is being coordinated by the MSU Amateur Radio Club, one of the oldest in the country (and one of the reasons I attended MSU). Possibly one of the most valuable fringe benefits of attending NOAC is that Scouts will get to know what living and dining on a major college campus is all about. They’ll attend events inside and out in venues ranging from college classrooms to Breslin Arena and Spartan Stadium, homes to MSU’s top-ranked basketball and football teams. It’s a great way for them to get a preview of college life and another way that Scouting helps them be prepared for what lies ahead. If you can’t be there, you can participate virtually through web updates at noac2015.org and by web streaming via NOAC TV. Staff videographers will be providing coverage which will include a nightly newscast and coverage of many conference events. There’s even an app for that – the conference has its own iOS and Android apps, so participants can keep track of their schedules and get updated conference information. NOAC 2015 – 100 years, looking back and planning for the future. Previous PostPrevious One down, two to go?